Tepin began the year as a promising 4-year-old filly in trainer Mark Casse’s stable. She ended the season as a leading candidate for the Eclipse Award as the nation’s outstanding turf female. Along the way, Tepin won five of seven starts in Florida, Kentucky, and New York. She was unbeaten in four starts at a mile. When it meant the most, she was at her best for owner Robert Masterson. Tepin’s win against males in the Breeders’ Cup Mile at Keeneland on Oct. 31 left Casse in tears, filled with pride for what the filly had accomplished and how his son and assistant, Norman, had helped guide her campaign. Tepin’s campaign started on a Saturday in March in south Florida, where she won her first start in seven months in an optional claimer at Gulfstream Park. That was her third win in nine career starts. At 2, Tepin won the Delta Downs Princess Stakes, but she struggled at 3 in 2014, going winless in four starts, all stakes. The win in the optional claimer was a bright start to the 2015 season and led to a brilliant spring. Early on the afternoon that American Pharoah won the Kentucky Derby, Tepin won the Grade 2 Distaff Turf Mile at Churchill Downs. Seven weeks later, hours before American Pharoah swept the Triple Crown in the Belmont Stakes, Tepin won the first Grade 1 of her career in the $700,000 Just a Game Stakes for fillies and mares at a mile on turf at Belmont. The Saratoga season was not as kind. Tepin lost two starts by about a neck, finishing second by a nose to Hard Not to Like in the Grade 1 Diana Stakes at 1 1/8 miles on turf in July and second by a head to Dacita in the Grade 2 Ballston Spa Stakes on Aug. 29. She has not lost since. 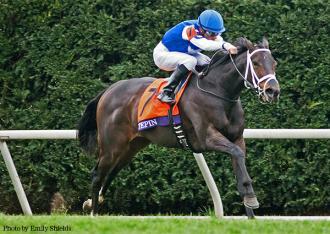 Returning to one-mile races, Tepin was the 8-5 favorite in the Grade 1 First Lady Stakes for fillies and mares on turf at Keeneland on Oct. 3. Ridden by regular jockey Julien Leparoux, Tepin stalked the pace in the $700,000 race and won by seven lengths, the widest margin of victory in her career. The performance gave Tepin solid credentials for the BC Mile. Conditions at Keeneland in the autumn fit Tepin well. The turf was soft for the First Lady and was listed as “good” for the BC Mile. Leparoux guided Tepin to a repeat performance of the First Lady, albeit one against a tougher field. Tepin was second for the first six furlongs, took the lead on the turn, and stormed clear to win by 2 1/4 lengths over the European Mondialiste. Tepin, bred in Kentucky by Machmer Hall and bought for $140,000 at the Fasig-Tipton Saratoga selected sale as a yearling, became the first filly or mare to win the BC Mile since Goldikova won the race for the third straight year at Santa Anita in 2010. They are part of a group of female winners that includes Royal Heroine, Miesque, Ridgewood Pearl, and Six Perfections. In 2015, Tepin showed she belongs on that list.